“When I joined London Art Portfolio, it was my aim to finish my portfolio and apply to university for the coming semester. I started the course in June 2015 and the first week was very challenging. I explored a range of techniques that were new to me and it was difficult to be out of your comfort zone, but when you become comfortable it is a great experience. I learned a lot during this week about hands on drawing. 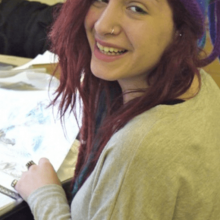 Robin joined LAP for personal development and become confident and open to new artistic horizons and directions in life. “I remember how much fun the class was, one of the best times of my life, really! I still want to pursue art and I’ve been working on some Korean character inspired designs lately, they are rather geometric and abstract and I was really inspired by the beautiful mandalas in India. I’d like to use them someday as tattoo designs or for t shirt deigns. Upon my return to New York I had a boyfriend that was a photographer and had worked in the fashion industry which led to being around so many artists that all have their own specialty, from woodcarving to graphic design to animation and painting – so great and inspiring! Laura was a complete beginner and after completing a 6 week course and returning back to Dallas, Laura decided to return to LAP to study for a further 6 week course after the Christmas break. It was a pleasure to see and tutor her once again. As a practicing Graphic Designer, Patricia was searching for fresh ideas and new inspiration. 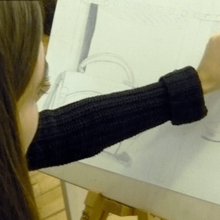 She had previously received thorough training in Graphics on CAD programmes, which meant she was less familiar with more ‘hands on’ drawing and design skills. 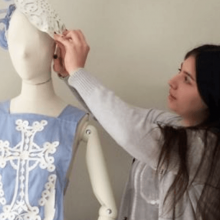 She was aware that although technology has advanced and is important in the design industry, a designer needs strong ‘hands on’ creative design skills using different papers and mediums alongside the use and application of high end CAD skills. “Following an intensive course with London Art Portfolio for my personal and professional portfolio development, Julia helped me to bring my design approach to the next level and at the same time to improve my expertise as a graphic designer. Furthermore, and beyond the course working with Julia has been a highly inspiring and enriching experience which truly added to my time in London. Julia has been both to me, a great mentor but also a friend. Her expertise and advise were of great value to me and by sharing her experiences Julia lightened the spark to apply for my Master’s degree. Though I applied frankly last minute, I got my interview right away and will start with my (pre-) master in September. After completing a Degree in Neuroscience, Annabelle still wanted to pursue her deep interest in botanical illustration and wanted to learn some new ideas and techniques for illustration, before beginning her MSc in Informatics. “Being a science graduate, I was certain that my artistic interests would have to take a permanent backseat. 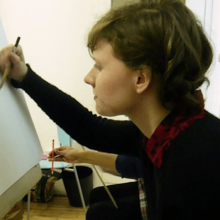 I decided to do this course to explore how far I could go with my art, and where I wanted to take it, and Julia made me realise that I don’t have to “settle”. Artistically I can continue to develop, grow, and complete projects – with the right tools and of course, the right attitude. Thanks to this course, I began to understand the value of practising and honing your craft. It is important to know how to build a project from the ground up, with time and perseverance, but it is also important to back up your ideas with practiced skill. We went on trips to museums in order to draw, draw, draw. My favourite pieces of mine come from things that I drew on these trips. Of course, practical benefits aside, the course itself is great fun. I met lovely and interesting people in the course, and Julia herself is fantastic and encouraging. When you see other people at work, it is a stimulating creative environment, and there is so much you can learn from each other. Now, I will be starting a MSc in Informatics at the University of Edinburgh, but I have gained the knowledge and confidence to take my art seriously and work on my projects in my own time, including a line of prints based on some of the work I did during the course.